This help page is for version 6.0. The latest available help is for version 7.2. The script window is where you enter your script. The script can do anything that can be done in the selected language (including creating external components if available) with all the standard restrictions. There are two Test buttons. One will run the script within the Console. The other will send the script to the monitoring service that is monitoring the target computer (Central Monitoring Service or a Satellite) and run the script there. This helps find any problems that might come up from the script possibly running on a different machine, or running as a different user (the service Log As user). Keep in mind that when the script runs, it might run on a different computer than where you are editing it. That means drive mappings, HKEY_CURRENT_USER registry hive, Internet Explorer settings and the currently running user will often be different. 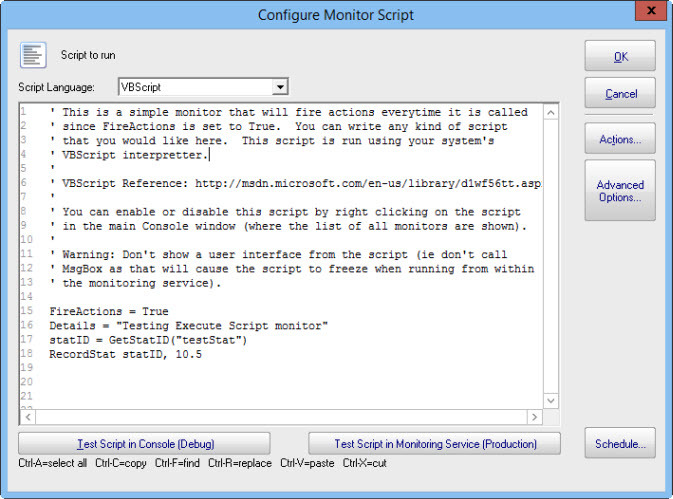 IMPORTANT: Do not show any user interface elements in the script -- they will not be visible in the monitoring service and will block the script from ever completing. This read-only string variable is the name of the computer that the monitor is attached to. This function retrieves the named value of a custom property. It checks the Monitor first, and if not found, checks the monitor's owning computer, and then the computer's group, and then the group's parent group, etc. Custom properties can be set on Groups, Computers and Monitors by right-clicking on the item and choosing the Custom Properties menu. This is a string value. This value is passed to any attached actions as the details for the action (ie the content of an email notification for example). Details = "Alert! Can't contact remote system"
This is a boolean value. If the value is set to True, actions attached to the monitor will fire. If it is False, they will not fire. The value defaults to False. GetStatID and RecordStat are used together to record integral data values to the database for reports. GetStatID is a function that takes a single string value and returns an integer statID. The string value should be a useful name to you, such as the name of the thing you're probing with the script. Including the server/device name in the string would be a good idea if a similar script will run on multiple computers -- it will make it easier to choose the specific data that you want when you create reports. RecordStat is a method that takes two inputs -- the statID obtained from GetStatID above, and the integer value to record to the database. The time the value is recorded also gets saved to the database for use in line charts, etc. GetValue method takes a text name and returns the value that was stored earlier via the StoreValue call described below. If nothing was ever stored with that name, an empty string is returned. The StoreValue method takes a text name, and a text value and stores it. This named value can be retrieved later (even when the script runs next) via GetValue. Note that these values will be persisted in the configuration database and kept in memory with the monitor, so they should be kept relatively small (a few hundred characters long or less). Request an inventory value for the current computer, or a different one. An inventory propertyID must be used to specify which inventory value to retrieve. An optional ComputerID value can be used to get the inventory value from a computer other than the current computer. If a property can have multiple values (CPU Names for example), each one will have a newline character appended. The inventoryID values are given below. Note that not all computers/devices will have all inventory values, and some may have none (especially if an Inventory Collector monitor is not added to the computer). Returns the numeric value that uniquely identifies this computer (Computer ID - CID) within the application. Useful in conjunction with the External API. This method will take the current value of FireActions and Details and report the result as though the monitor had finished. This is a way for a monitor to report multiple individual errors, similarly to how some other monitors have a "report each event separately" check box. This method sends an email message to the recipient that you choose. This method can also send the email in HTML format if it sees the <!DOCTYPE in the body of the message. SendMail "to_address@host.com", "from_address@host.com", "Subject of message", "Body of email message"
Custom Properties can be used in directory paths, email messages, scripts and other places. Your script can set a Custom Property on a computer by giving it's ID (first parameter). If the ID is 0, the computer the monitor is running on will be targeted. This VBScript method takes a single integer value, which is the number of milliseconds that the script should stop and sleep. Be careful about using this: causing too many monitors to sleep for very long means other monitors may not get run. This method takes a string value and appends it to the service's log file (useful for debugging scripts). The line will start with MONITOR_SCRIPT_LOG. ToLog "Arrived at first loop"
Custom Properties can be used in directory paths, email messages, scripts and other places. Your script can set a Custom Property on the computer whose ID is given (first parameter), or use 0 to indicate the computer the monitor is running on should be targeted. This method takes a single integer value, which is the number of milliseconds that the script should stop and sleep. Be careful about using this: causing too many monitors to sleep for very long means other monitors may not get run. PowerShell interaction happens via the $mon object. $mon.Details = "Alert! Can't contact remote system"
GetMonitorList is a function that uses the Server ID to return a list of monitors assigned to the server and the monitor's attributes. The server ID can be for any server and if no server is given the default will be the current server that this monitor is assigned to. The returned value is a Hashtable that can be iterated through to find the value needed. GetServerList is a function that returns a list of servers assigned to a group and the server's attributes. Two parameter are needed for this function; GroupID and include Child Groups. If no GroupID is used the default 0 is used, which is the entire list of servers at the root level. The second parameter is a switch used to return or not return servers that are in child groups under the starting group. Use to 0 to return all servers and 1 to return servers at the parent level only. The returned value is a Hashtable that can be iterated through to find the value needed. The GetValue method takes a text name and returns the value that was stored earlier via the StoreValue call described below. If nothing was ever stored with that name, an empty string is returned. This method sends an email message to the recipient that you choose. Custom Properties exist on groups, computers and monitors. This function lets you set the custom property on a computer. You can specify the computer ID in the first parameter, or set it to 0 to indicate the computer the monitor is running on should be targeted. The PowerShell cmdlet takes two parameters. The first parameter specifies timer in seconds (-s) or milliseconds (-m) and the second is an integer that specifies period of time. SSH is a little different than the others. In this case, your script will be sent to the remote computer/device to run. The resulting terminal output is scanned for the special keywords below, and they will be 'executed' in the monitoring service when the script finishes. The keywords have to start in the very first column to be recognized. This is a string value. This value is passed to any attached actions as the details for the action (ie the content of an email notification for example). This particular value can span multiple lines. The value is terminated when a ") is seen. This 'function' will record a statistic returned from the script to the database. It is equivalent to GetStatID and RecordStat in the other languages above. The first parameter is a string value. The string value should be a useful name to you, such as the name of the thing you're probing with the script. The second value is a numeric value that will be stored. strDetails = "There are only " & objrecordset.Fields(0) & " rows in the table!" strDetails = "CODE RED !!!! No rows found!" Details = FileToCheck & " is too small!" Details = FileToCheck & " does not exist!" Details = "NEWEST LOG FILE older than 6 hours (latest file " & fNewest.DateCreated & ")"
Details = "Everything is OK"
$mon.Details= &powershell.exe "c:\skripte\VM_LUN_Freeperc.ps1 VC1 vmguest1_5z"
$String += "The Domain Controller $($Name.ToUpper()) is having difficulty replicating The following servers:`n`n"
$String += " " + $Source + "`n"
If you would like to share your script, please contact us.